All of us with a vested interest in the sport of boxing sometimes feel frustrated that our star has fallen. We know the majesty of the sport, when done right, by the most laudable athletes on the planet. We know I say the most laudable because anyone that has ever tried to box, when starting out, knows the unknowable difficulty of scrapping for 30 seconds..let alone three minutes..let alone 12 rounds. We think our sport deserves better, doesn’t deserve to have that stupid “boxing is dead” or “boxing is dying” meme be so pervasive. So, sometimes we ponder why it isn’t shining brighter and higher and doesn’t get that mainstream attention it has in the past. First and maybe foremost, I think it is the cast of characters who take the stage. If and when that next nova flourishes, that next Mike Tyson type with outrageous intensity and power is unleashed on us…or a Sugar Ray Leonard type, with blazing fast hands, a shark’s instinct to bite often and with fatal intent, a willingness to take on all comers combined with a magnetic personality, then the sport will get the injection of widespread interest it deserves. Another element why our fair sport has dipped in popularity is that it is hidden behind too many paywalls. The premium cable paywall, and then the double wall, of PPVs composed by premium cable companies, limits our exposure. There are reasons for that construct, of course, most prominently because if we didn’t enjoy this “red light district sport,” we’d have the backing of sponsors and corporations and such that the “big 4” sports enjoy in the US: MLB, NBA, NFL and NHL get backed heavily by beer companies and “respectable” persons from all walks of life. Rarely in their milieus do practitioners get busted in organized crime rings. And when they do transgress, as so many NFLers do, well, the action when focused on by a significant number of first time potential fans doesn’t reflexively turn them off. A large number of people cannot and will not warm up to the site of two persons punching each other with the desired finish being one person is so punished that their senses are scrambled to the point of unconsciousness. 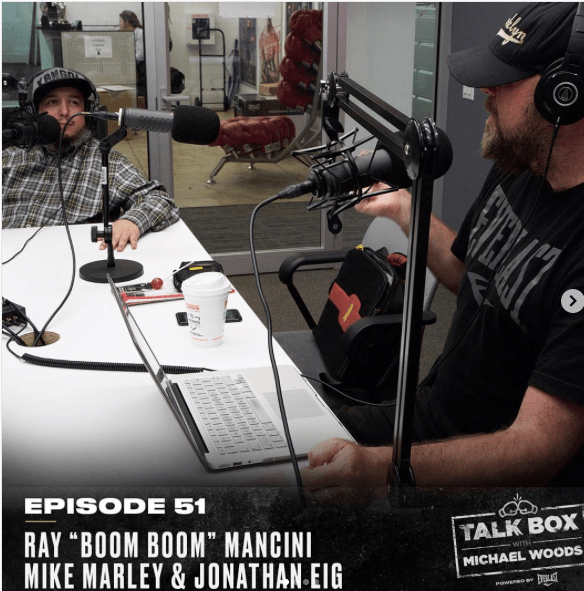 One guest on the last TALKBOX, Hall of Fame lightweight Ray Mancini, who did indeed package power and aggression and savage intent and charisma to get him to a place of international prominence, spoke of yet another element which hold the sport back and down. We chatted about how some of these guys are bewildered why they aren’t more popular…why their title belt doesn’t translate into mass recognition. Mancini kept hammering, telling young guns to stay active. Take non title fights….Adonis, stay in shape, and get right back in the ring, Mancini counsels. “Showcase your talent to your city, showcase your talent to your fans, and stay active,” said the living legend, with the wisdom that comes from having lived it. Check out the entirety of the interview on the podcast, and then feel free to delve into our year’s worth of archives.